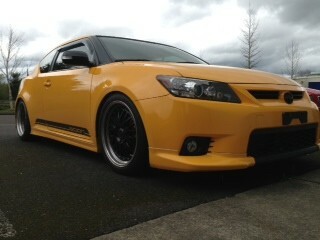 During the ongoing FT86 project, we’re also in the middle of working on the MY11+ 2.5L Scion tC. We’re completing the first performance maps now and will be selling kits by 15 April. Electrical schematic so we can wire in the Unichip to ensure it becomes seamlessly integrated into the OE electrical system. Hopefully there’s an OE schematic available and all we have to do is pin-out the wires we’re interested in to verify the schematic… as with the FR-S, the new tC exactly matched the schematic. Signal analysis so we can configure the Unichip to correctly communicate with the OEM computer. The good news is that the new tC, despite the new engine, uses the same set up parameters as the 2.4L. The final preliminary task is looking at the connectors to ensure they’re either available for purchase or are something we want to make in house. With the 2.5L, we found that two of the connectors were the same as those found on other kits we manufacturer and for the third, one of the plugs was available and the other half is a simple piece we’re making in house. Once the Unichip is electrically connected and communicating, the next step is seeing how much tuning room is in the OE fueling and timing curves. At this point, we’re not yet tuning for power per se, just seeing how far we can move things what the factory computer thinks about those changes. Although in many respects, an Otto-cycle gasoline engine is an Otto-cycle gasoline engine, how the OE effects control can and does vary between manufacturers and, sometimes, between vehicle types. We’ve flying through mapping… the car is an absolute pleasure to work on. The OE ECU solution is stable and happily works with our tuning inputs. Based on the preliminary tuning results and our extensive experience tuning Toyota vehicles, we were anticipating about a 15 bhp gain… which is right what we found..
We’ve completed the map “families” for the Stock Air Box, Drop In Filters, the Injen intake, the TRD intake, and the Takeda intake. The K&N intake is one the car now – should be completed today – and the Weapon R intake is next in line. Our Map Families group performance maps that share similar data… the “father figure” in a map family is the intake, even if it’s just the stock air box. For normally aspirated engines with a MAF sensor for air flow ( like the tC ) the bolt-on that has the biggest single impact calibration is the intake… more specifically the intake tube holding the MAF. That doesn’t necessarily mean the intake makes the most power, but because it rescales the relationship between actual airflow and the airflow perceived by the ECU, the lion’s share of the work goes into making the “father” map correct and the rest of the family maps are modifications of that main map. 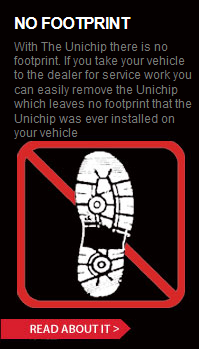 The increased airflow resulting from headers and exhaust modifications is generally seen and correctly tuned by the Unichip and the OE ECU once the intake mapping is done. With the intake mapped, we then modify the tune as required for the intake and exhaust, and finally, the intake, headers, and an exhaust. Each of those configurations is additionally mapped for premium fuel, midgrade fuel, and low octane fuel… when we’re finished, we have a total of 9 “standard” maps in the intake family. Once those standard maps are finished, we create stepped timing and fueling variations of each map to accommodate minor variations. For example, we modify the 92-octance “standard” map with slightly more ignition timing for cars that will accept more timing… and then modify it again with slightly less ignition timing for cars that want slightly less either because of the particulars of that specific vehicle or regional variances in fuel. We then create similar changes on the fueling side… this time, one map has slightly more fuel and one slightly less. When we’re finished, each map family features 81 different maps in each family covering “in family” bolt-on changes, different fuels, and accommodate specific vehicle variations… all available to end users on line in our map library. Instead of going to the dyno, you can load and test different maps… at home… in about a minute… for about 10% of what you’ll send at the dyno. We’re happy to say that we launched the tC G2 kit through a forum… lots of guys jumped in over the first weekend and have the kits on their cars. The response has been great… no installation issues or questions and everybody has been really happy with the performance change… nothing better than happy customers playing with their cars.